Reading and share top 187 famous quotes and sayings about Parting by famous authors and people. 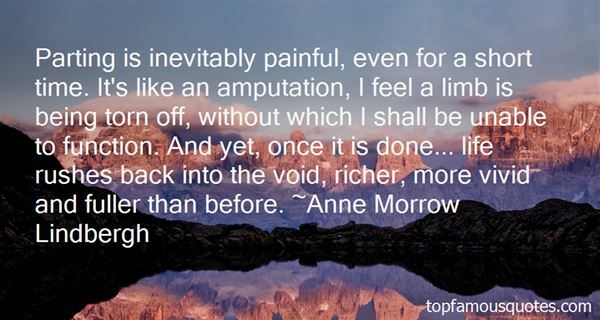 Browse top 187 famous quotes and sayings about Parting by most favorite authors. 1. "But my attention's elsewhere, drawn to that warm wonderful pull, the familiar loving essence that only belongs to one person—only belongs to him—Watching as Damen cuts through the water, board tucked under his arm, body so sculpted, so bronzed, Rembrandt would weep. Water sluicing behind him like a hot knife through butter, cleanly, fluidly, as though parting the sea.My lips part, desperate to speak, to call out his name and bring him back to me. But just as I'm about to, my eyes meet his and I see what he sees: me—hair tangled and wet—clothes twisted and clinging—frolicking in the ocean on a hot sunny day with Jude's tanned strong arms still wrapped around me.I release myself from Jude's grip, but it's too late. Damen's already seen me.Already moved on.Leaving me hollow, breathless, as I watch him retreat.No tulips, no telepathic message, just a sad, empty void left behind in his place." 2. "Love is not simply the sum of sweet greetings and wrenching partings and kisses and embraces, but is made up more of the memory of what has happened and the imagining of what is to come." 3. "Parting is inevitably painful, even for a short time. It's like an amputation, I feel a limb is being torn off, without which I shall be unable to function. And yet, once it is done... life rushes back into the void, richer, more vivid and fuller than before." 4. "He had been afraid of finding things quite different, and now it pained him to find them so unchanged. the prospect of meeting people, of looking up old friends left him vaguely bored. from a distance fancy is free to roam. the tender friendships one gives up, on parting, leave their bite on the heart, but also a curious feeling of a treasure somewhere buried. what selfish love such flights occasionally attest !" 5. "My grief was a heavy, despairing sadness caused by parting from a companion of many years but, more important, it was a despair rooted in the fear that love did not exist, could not be found. And even if it were lurking somewhere, I might never know it in my lifetime. It had become hard for me to continue to believe in love's promise when everywhere I turned the enchantment of power of the terror of fear overshadowed the will to love." 6. "He did not appear to be a very tall man; what I could see of legs seemed stumpy, though heavily muscled. His chest was broad and deep. Later I learned that he swam in the sea almost every morning. His thick strong arms were circled with leather wristbands and a bronze armlet above his left elbow that gleamed with polished onyx and lapis lazuli... Puckered white scars from old wounds stood out against the dark skin of his arms, parting the black hairs like roads through a forest... Odysseos wore a sleeveless tunic, his legs and feet bare, but he had thrown a lamb's fleece across his wide shoulders. His face was thickly bearded with dark curly hair that showed a trace of grey. His heavy mop of ringlets came down to his shoulders and across his forehead almost down to his black eyebrows. Those eyes were as grey as the sea outside on this rainy afternoon, probing, searching, judging." 7. "Every parting gives a foretaste of death, every reunion a hint of resurrection. —ARTHUR SCHOPENHAUER, German philosopher"
8. "You English have a saying which is close to my heart, for its spirit is that which rules our boyars: "Welcome the coming, speed the parting guest." 9. "I can feel her next to me. This union. Of warmth. Of caring. Of the indescribable. As if there were no parting and never could be." 10. "All partings foreshadow the great final one." 11. "Medicine, electronic communications, space travel, genetic manipulation . . . these are the miracles about which we now tell our children. These are the miracles we herald as proof that science will bring us the answers. The ancient stories of immaculate conceptions, burning bushes, and parting seas are no longer relevant. God has become obsolete. Science has won the battle." 12. "So, how's school? How's everything going? ""Can Gio hear us? "… "Yes""Oh, well then, it's going magnificently. I'm so fortunate to have a knowledgeable and patient teacher like my uncle, who is imparting his centuries of wisdom into my eager young mind." 13. "The afternoon had made them tranquil for a while, as if to give them a deep memory for the long parting the next day promised." 14. "The kiss, dear maid ! thy lip has leftShall never part from mine,Till happier hours restore the giftUntainted back to thine. Thy parting glance, which fondly beams,An equal love may see:The tear that from thine eyelid streamsCan weep no change in me. I ask no pledge to make me blestIn gazing when alone;Nor one memorial for a breast,Whose thoughts are all thine own. Nor need I write --- to tell the taleMy pen were doubly weak:Oh ! what can idle words avail,Unless the heart could speak ? By day or night, in weal or woe,That heart, no longer free,Must bear the love it cannot show,And silent ache for thee." 15. 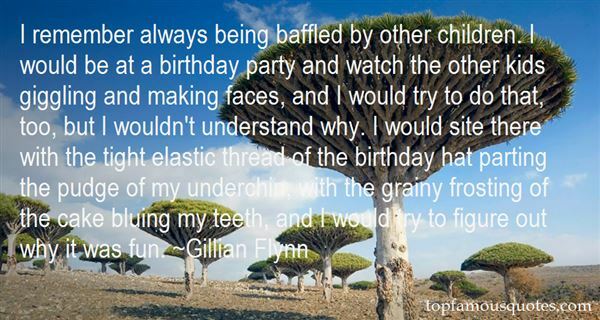 "I remember always being baffled by other children. I would be at a birthday party and watch the other kids giggling and making faces, and I would try to do that, too, but I wouldn't understand why. I would site there with the tight elastic thread of the birthday hat parting the pudge of my underchin, with the grainy frosting of the cake bluing my teeth, and I would try to figure out why it was fun." 16. "StagesAs every flower fades and as all youthDeparts, so life at every stage,So every virtue, so our grasp of truth,Blooms in its day and may not last forever.Since life may summon us at every ageBe ready, heart, for parting, new endeavor,Be ready bravely and without remorseTo find new light that old ties cannot give.In all beginnings dwells a magic forceFor guarding us and helping us to live.Serenely let us move to distant placesAnd let no sentiments of home detain us.The Cosmic Spirit seeks not to restrain usBut lifts us stage by stage to wider spaces.If we accept a home of our own making,Familiar habit makes for indolence.We must prepare for parting and leave-takingOr else remain the slaves of permanence.Even the hour of our death may sendUs speeding on to fresh and newer spaces,And life may summon us to newer races.So be it, heart: bid farewell without end." 17. "The reasaon I'm shy of objects is because I like them. I transfer the thoughts that are against me onto them. Then these thoughts go away, unless I talk about them - just like my wariness of people. Maybe it all collects in your hair.After I separated from my husband, in the quiet days when no one was shouting at me anymore, I started noticing other people's wariness of strangers. I saw how they combed their hair in public. In the factory, in the city, in the streets, and trams, buses, and trains, while waiting in front of a counter or standing in a line for milk and bread. People comb their hair at the movies before the light goes out, and even in the cemetery. While they're parting their hair you can see their wariness of others collecting in their combs. But they can't comb it out completely if they go on talking about it. The fear of strangers sticks to the comb and makes it greasy. People who talk about it can't get rid of their fear of strangers; their combs are always clean." 18. "Just before the Clear Air Turbulence went back into warp and its crew sat down at the table, the ship expelled the limp corpse of Zallin. Where it had found a live man in a suit, it left a dead youth in shorts and a tattered shirt, tumbling and freezing while a thin shell of air molecules expanded around the body, like an image of departing life." 19. "She was actively frightened of imparting confidences, because she feared that they might betray the world of oddness that lived inside her"
20. "Torment in the dark was the danger that I feared, and it did not hold me back. But I would not have come, had I known the danger of light and joy. Now I have taken my worst wound in this parting, even if I were to go this night straight to the Dark Lord. Alas for Gimli son of Glóin!" 21. "All that befell: in her joys, her pipe in the evening, her man at night, the children she suckled, and guided on their first short steps; and in her tribulations, death, and parting, and the lash, she did not forget that deliverance was promised and would surely come. She had only to endure and trust in God." 22. "Marianne would have thought herself very inexcusable had she been able to sleep at all the first night after parting from Willoughby. She would have been ashamed to look her family in the face the next morning, had she not risen from her bed in more need of repose than when she lay down in it. But the feelings which made such composure a disgrace, left her in no danger of incurring it. She was awake the whole night, and she wept the greatest part of it. She got up with an head-ache, was unable to talk, and unwilling to take any nourishment; giving pain every moment to her mother and sisters, and forbidding all attempt at consolation from either. Her sensibility was potent enough!" 23. "Aging and the prospect of dying by no means enhance the attractiveness of fictitious comforts to come in paradise, or the veracity of malicious myths about hellfire and damnation. Fear and feeblemindedness cannot be credibly pressed into service to support fantastic claims about the cosmos and our ultimate destiny.Whether one would even consider turning to religion in advanced years has much to do with upbringing, which makes all the more important standing up to the presumptions of the religious in front of children. One would regard the Biblical events – a spontaneously igniting bush, a sea's parting, human parthenogenesis, a resurrected prophet and so on – that supposedly heralded God's intervention in our affairs as the stuff of fairy tales were it not for the credibility we unwittingly lend them by keeping quiet out of mistaken notions of propriety." 24. "I wished I had told her what I was doing. I wished I had said more, argued more. Maybe then I wouldn't have this hollow ache in my chest whenever I thought of our parting words. Had she already moved on, forgotten me? In her position, what she said made sense, but the thought of her with someone else made me wish I had something to fight, to kill, just so I could forget." 25. "I didn't hear the exact moment Sarren ended Zeke's life. I was just aware of his breathing, tagged at first, then seizing up, as if he could no longer gasp for her. And then, a long, agonizingly slow exhale, the last gulp departing his lungs, as Ezekiel's tortured breaths finally, irreversibly, stopped altogether. "Good night, sweet prince." Sarren crooned, a velvet whisper.The recording clicked off." 26. 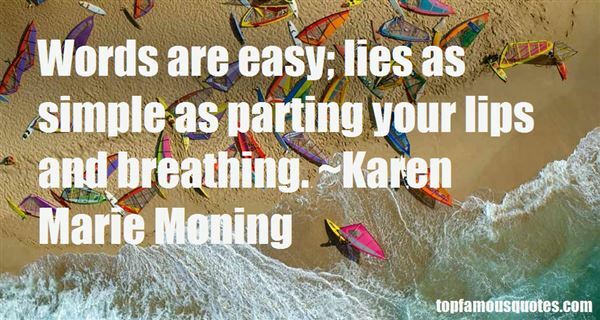 "Words are easy; lies as simple as parting your lips and breathing." 27. "Our eyes met and his grin stretched another quarter-inch. Another schoolgirl flip--followed by a very un-schoolgirl wave of heat. He leaned even farther over the boards, lips parting to say something. "Hey, Kris!" someone yelled behind him. "If you want to flirt with Eve, tell her to meet you in the penalty box. You'll be back there soon enough." 28. "I think the most beautiful thing is that we're not parting because there were problems. We're parting because we're celebrating each others' growth." 29. "It was November--the month of crimson sunsets, parting birds, deep, sad hymns of the sea, passionate wind-songs in the pines. Anne roamed through the pineland alleys in the park and, as she said, let that great sweeping wind blow the fogs out of her soul." 30. "We have come to a parting of the ways,I suppose",said Anne thoughtfully. "we had to come to it,do you think,Diana,that being grown up is really as nice as we used to imagine it would be when we were children? ""I don't know-there are SOME nice things about it,"answered Diana,again caressing her ring with that little smile which always had the effect of making Anne feel suddenly left out and inexperienced. "But there are so many puzzling things,too.Sometimes I feel as if being grown-up just frightened me-and then I would give anything to be a little girl again." 31. "Art is not alone in imparting charm and mystery to the most insignificant things; pain is endowed with the same power to bring them into intimate relation with ourselves." 32. "When you are mad, mad like this, you don't know it. Reality is what you see. When what you see shifts, departing from anyone else's reality, it's still reality to you." 33. "Cool morning shadows sadly shift across the floorEach time we say goodbye it's harder than beforeEven after all the pain of parting still we findThat we must mourn the death of the dreams we leave behindAs I turn my back on all that means the most to meThe sounds and smells, the light that dances on the seaThe greatest gamble is to act on the beliefThat only the slave who leaves it all is truly freeThe sacrifice that we both lay before His feetA thousand moments that belonged to usThat now will never beBy faith we hold a better dream inside our heartsA time when our family will never have to be apartTill then we struggle with just what it really meansAnd we will mourn the death of our beautiful dreamsMourn the death of our beautiful dreams"
34. "I felt a pang in my heart, as I did at our first parting. How I rejoiced to feel it. Was it youth coming back to me with all its healthy passions, or was it just youth's farewell glance, a parting gift to remember it by?" 35. "The logs of wood which move down the river together Are driven apart by every wave. Such inevitable parting Should not be the cause of misery." 36. "It's lonely to say goodbye. Very lonely. Partings are the beginnings of new meetings. Beginnings happen because there are endings…Meetings. Beginnings. It's not too late…to believe in them after the fact." 37. "When we struggle for human rights, for freedom, for dignity, when we feel that it is a ministry of the church to concern itself for those who are hungry, for those who have no schools, for those who are deprived, we are not departing from God's promise. He comes to free us from sin, and the church knows that sin's consequences are all such injustices and abuses. The church knows it is saving the world when it undertakes to speak also of such things." 38. "Just cuz yer going there and I'm staying here," I say. "It don't mean we're parting. ""No," she says and I know she understands. "No, it certainly doesn't. ""I ain't parting from you again," I say, still looking at our fingers. "Not even in my head." 39. "Good-bye, Mrs Bartholemew," said tom, shaking hands with stiff politeness; "and thank you very much for having me. ""I shall look forward to our meeting again," said Mrs Bartholemew, equally primly. Tom went slowly down the attic stairs. Then, at the bottom, he hesitated: he turned impulsively and ran up again - two at a time - to where Hatty Bartholemew still stood...Afterwards, Aunt Gwen tried to describe to her husband that second parting between them. "He ran up to her, and they hugged each other as if they had known each other for years and years, instead of only having met for the first time this morning. There was something else, too, Alan, although I know you'll say it sounds even more absurd...Of course, Mrs Bartholemew's such a shrunken little old woman, she's hardly bigger than Tom; anyway: but, you know, he put his arms right round her and he hugged her good-bye as if she were a little girl." 40. "Exhaustion has a way of parting the veils between men, not so much because the effort of censoring their words exceeds them, but because weariness is the foe of volatility. Oft times insults that would pierce the wakeful simply thud against the sleepless and fatigued." 41. "I don't care how things stand, every girl wants to feel beautiful when they see 'that ex' again. You know the one I'm talking about. The one that had claimed enough of you that some of it had been lost in the parting." 42. "Be ahead of all parting, as though it already were behind you, like the winter that has just gone by. For among these winters there is one so endlessly winterthat only by wintering through it will your heart survive." 43. "A craftsman pulled a reed from the reedbed,cut holes in it, and called it a human being.Since then, it's been wailing a tender agonyof parting, never mentioning the skillthat gave it life as a flute"
44. "Such a little thing really, a kiss... most people don't give it a moment's consideration. They kiss on meeting, they kiss on parting, that simple touching of flesh is taken entirely for granted as a basic human right." 45. "Any parting could be forever, and we don't know." 46. "In theory, sure, Gregor could still go home. Pack up his three-year-old sister, Boots, get his mom out of the hospital, where she was recovering from the plague, and have his bat, Ares, fly them back up to the laudry room of their appartment building in New York City. Ares, his bond, who saved his life numerous times and who had had nothing but suffering since he had met Gregor. He tried to imagine the parting. "Well, Ares, it's been great. I'm heading home now. I know by leaving I'm completely dooming to annihilation everbody who's helped me down here, but I'm really not up for this whole war thing anymore. So, fly you high, you know?" Like that would ever happen." 47. "I saw their mouths going up and down without a sound, as if they were sitting on the deck of a departing ship, stranding me in the middle of a huge silence." 48. "The adjacent shores resounded with the alternate shouts of the sons of liberty and the groans of their parting spirits." 49. "Thel is like a watry bow, and like a parting cloud,Like a reflection in a glass, like shadows in the water,Like dreams of infants, like a smile upon an infant's face,Like the dove's voice, like transient day, like music in the air.Ah! gentle may I lay me down, and gentle rest my head,And gentle sleep the sleep of death, and gentle hear the voiceOf him that walketh in the garden in the evening time." 50. "Good night, good night! Parting is such sweet sorrow, that I shall say good night till it be morrow." There is great danger in this Golden Mean, one of whose main objects is to steer clear of shipwreck, Scylla being as fatal as Charybdis. No, this lofty and equable attitude is worse than wrong unless it derives from striking the balance between two very distant opposites. One of the worst perils of the present time is that, in the reaction against ignorant bigotry, people no longer dare to make up their minds about anything. The very practice, which the A?A? so strongly and persistently advocates, tends to make people feel that any positive attitude or gesture is certainly wrong, whatever may be right. They forget that the opposite may, within the limit of the universe of discourse, amount to nothing.[.... ]Of course, in no case does the Golden Mean advise hesitating, trimming, hedging, compromising; the very object of ensuring an exact balance in your weapon is that its blow may be clean and certain."